Joe Canning - supporting Galway charities. Galway hurling team players will champion two great causes, Galway Hospice and COPE Galway, in a community event hosted by AIB Galway staff. The event takes place in the Clayton Hotel, Ballybrit, on November 1 from 5pm to 7pm, and guests can enter a raffle to raise funds for the two charities and win some great prizes, including three photos signed by the All-Ireland champions. 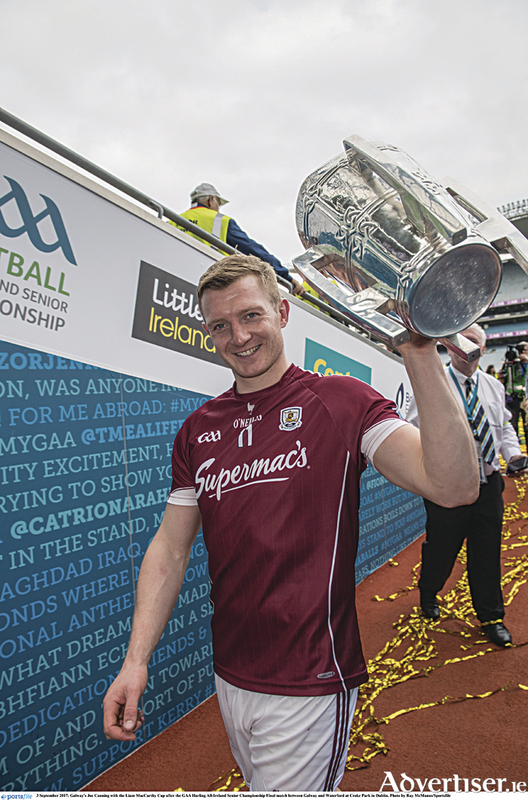 Joe Canning and two members of the All-Ireland winning team will be on hand for photos with the four winning cups including the Liam McCarthy Cup. Adrienne Turley, branch manager of AIB Newcastle Road, says the Galway staff wanted to join forces to give to the community by way of collecting for the two charities. Michael Craig, fundraising manager at Galway Hospice, says Galway Hospice is delighted to be part of such a positive community event, celebrating the many GAA successes of this year. Proceeds from the event will help Galway Hospice provide palliative care to adults and children throughout Galway city and county who are dealing with a diagnosis of cancer or other life-limiting illness. Last year, 692 patients and their families/carers availed of its specialist care services, he says. Marie Anne Michel, fundraising manager at COPE Galway, says COPE is thankful to AIB staff for organising this event. "We are delighted to be part of this event as a local organisation that is working towards an improved quality of life in a home of your own. The charity provides services for homeless men, women and children; services for women and children experiencing domestic violence; and services for older people." For more information on the event contact Adrienne Turley, AIB Newcastle Road on 091 524466.